After removing the fixed and small hopper windows from the bus we installed 4 awning windows and one sliding window in Blu. Aside from these there's single pane glass right around the front of the bus and in the door. The awning windows and the sliding window are all from Dometic, although the sliding windows aren't commonly sold in Australia so we bought them all from the Reimo distributor in Brisbane. They're European windows, double pane acrylic with built in insects screens and blinds, and, surprisingly, we found them less expensive to buy here than in Europe. If you read some forum posts you'll find many an Aussies fighting with their Dometic windows. It's the built in screens/blinds that they seem to fight with. And, although I still think they are possibly the best RV windows on the market, I admit that they aren't without fault. We've installed ours with the blind rolling up from the bottom and the screen rolling down from the the top. We prefer it this way, but some people install them the other way around; I expect it's just because they're used to blinds coming from the top. At any rate, I recon the built in, roller, blinds and screens are a smart idea. 1) they're white. Australian houses are commonly screened with black/ dark grey/ charcoal screens on windows and doors: they are easier to see through and it they absorb some light. We're living with the white screens, but one day we'll replace them (we can disassemble them and do this ourselves). .
2) in a strong wind they will bellow out, the blinds will too. It a strong wind you can't use them! 3) the screen and blind snap together (great), but it is difficult to line them up to snap them both in at the same time and not get a gap at one end. My solution? Put the blind all the way up, then attach the screen with hands at either end of the blind (don't bother pushing at the clips), then use the middle release to slide the blind and screen to the desired position. 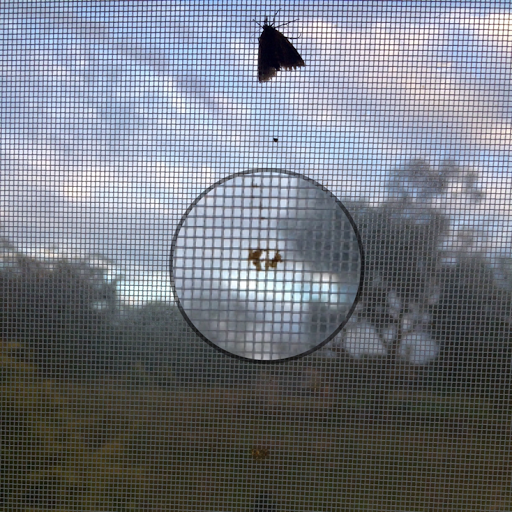 4) little insects come through the screen. But, a screen with smaller holes would allow less air movement and bellow out more. Solution? We got some mosquito chasing gizmos that plug into a USB port (they take pads) and I'm trialling treating the screens (every 6 months, I think) with permethrin (that's what mozzie nets for sleeping under are treated with). 5) insects get caught and squished it the rolled up blind/screen. Solution? A bit of extra cleaning (sorry! ), unfortunately they'll stain sometimes (another negative on white screens). If the insects get between the screen and the fixed part of the sliding window and get squished there you won't be able to get at them the clean then off. Yuck! In this photo, with a piece magnified (one of 5 swish marks from a predecessor), you can see a moth at the top that we'll have to chase off before we close the screen, which might mean going outside with a broom. If we don't chase it it'll get squished like its predecessor and leave a trail of squish marks at the same point on the roll, each roll, as the predecessor did. Sometimes when closing up at night you just don't see them. Finally, if you are installing a double pane window and it has a small hole be sure to put a grommet in the hole (or tape it). Our sliding window has 2 holes in each panel but came to us with one grommet missing. A fly crawled in, couldn't find its way out again, and now we have a dead fly in there forever more! So, that hole is taped now.